Driverless cars may help the environment, but what impact will they have on jobs in the transport sector? The future of work is a key topic at the World Economic Forum's Annual Meeting 2017. Watch the Promise or Peril: Decoding the Future of Work session here. A war on wheels has been raging in London since Uber started operating there four years ago. Traditional black cab drivers have been up in arms about the new high tech disruptor. 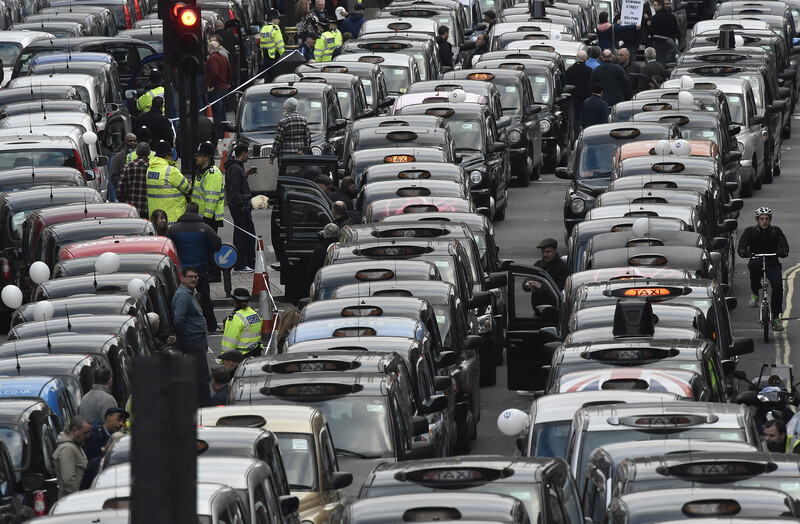 Uber has accused London’s Mayor of siding with the black cabs and has taken legal action against Transport for London, which is planning new regulations to limit the number of private hire vehicles. In November, more than 100 Uber drivers mounted a "go slow" protest in London to put pressure on the company to pay the minimum wage. More than 30,000 Londoners per week are signing up to Uber. The consequence? London now has more than 40,000 private drivers registered with Uber, in addition to the capital's existing fleet of regulated black cabs. There are now thousands more vehicles on the streets and greater traffic congestion, resulting in slower, more expensive journeys, and more emissions: 9,000 Londoners die every year as a direct consequence of air pollution. Technology will provide even further disruption, as, within a decade or two, driverless electric vehicles will partly address the air pollution problem. What will the redundant drivers then do, aside from breathing cleaner air? Numerous conferences, workshops, books and websites are devoted to building “disruptive know-how” in companies, but all of society needs to think critically about disruption. Applications being developed for the use of artificial intelligence, robotics, big data and the Internet of Everything are enormously consequential. Yet the disruptive effects of innovation are nothing new: the farm worker, transported to the industrial factory in the latter half of the 18th century, would have experienced levels of devastation to their lives and society that make the present changes seem minor in comparison. These changes, which continued for more than a century, sparked backlashes from the Luddites, revolutionary ferment from Karl Marx, and inspired Benjamin Disraeli’s lament that Britain had become “two nations” almost irredeemably divided. Creative destruction - or poverty trap? As Joseph Schumpeter argued 75 years ago, innovation is a process of creative destruction. The social and political challenge is to accentuate the creative and mitigate the destructive. We need to balance the debate that celebrates the virtues of rapid change, agility and entrepreneurship; with consideration of the ways societies, and their citizens, cope with and benefit from the considerable turbulence generated by technological change. The political backlash to this comparative lack of concern is seen in Trumpism and Brexit. Globalisation, productivity and innovation may be the mantra for their beneficiaries, but for many they mean job losses, working harder, and ever more uncertainty at work. The challenges are immense. Take the car industry: responsible for more than 50 million jobs and perhaps incalculable wider economic benefits. Yet its products pollute, and more than 1 million people every year are killed on roads. We may have a solution: electric and driverless cars. But the largest employment group in the USA is truck, van and taxi drivers, many of whom would lose their jobs. If you own a Tesla car that needs maintenance, the problem is often fixed by an overnight software update rather than taking it to the nearby garage. The Taiwanese contract electronics firm Foxconn, maker of the iPhone, has replaced half its workforce with robots since the iPhone 6 was launched. Accentuating the creative and mitigating the destructive in such circumstances is extremely confronting. There are many pessimistic views on the onslaught of technology, with suggestions that all but the most creative and skillful of jobs are under threat – though computers are being trained to take on creative and even artistic functions too, as Martin Ford explains in The Rise of the Robots. Jobs can be protected temporarily and expensively from technological progress, but, in the end, what matters is social adjustment. Technology is an artifact of the society that creates and uses it, and its impact results from its co-evolution with citizens and institutions. Algorithms are not impartial, but products of culture, politics and society – the same things that shape the humans who design and use them. Students of innovation show how the disrupting effects of the vast waves of technological change since the industrial revolution are accompanied by social changes, including new skills, industrial relations and regulations. In contrast to these past disruptions, today's occur in a period of unparalleled prosperity in many parts of the world. Here it is worth remembering John Maynard Keynes: writing in 1930 about the “economic possibilities for our grandchildren”, Keynes acknowledges the need for painful readjustment to technological unemployment. He writes of the dread and "nervous breakdown" in society, as people experience its adverse consequences, and how this is “a fearful problem for the ordinary person, with no special talents”. Keynes also refers to the challenges of a period of prosperity: the confrontation, for the first time, of freedom from economic cares; and working three-hour shifts and 15-hour weeks. To manage this, he argues, we must “honour those who can teach us how to pluck the hour and the day virtuously” and “how to occupy the leisure (…) to live wisely and agreeably well”. The real question is how we adjust to a world with significantly less of what we know as work. Companies have a duty to use their expertise in disruption to help deal with this enormous social turmoil. Technological disruption is exacerbating social inequalities, and we need to talk seriously about the virtues of a social wage. We need to fund people to work, without necessarily being employed, in a manner that allows them to help others or practice their skills in ways that they find meaningful and rewarding. To this end, education needs to change from readying people for a (probably non-existent) job to preparing them to create self-defined work. Embedding coding in the curriculum is great, but it only gets us so far. Education systems need to reject the barbarism epitomised by the UK's national school curriculum, which no longer includes the study of art history, classic civilization or archaeology. Given the UK’s cultural influence internationally, such moves are remarkably short-sighted. In a world where conventional jobs are fading away, but we have greater opportunities to “live wisely”, T S Eliot’s dictum, that culture is what makes life worth living, is an important guide.